^ See commentary on Western League page. 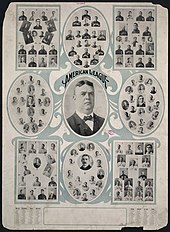 The Indianapolis and Minneapolis teams were replaced by teams in Baltimore and Philadelphia in 1901, but it is unclear and disputed as to which team went where. ^ "Bankrupt Orioles". Baseball-Reference. Archived from the original on July 23, 2014. Retrieved July 20, 2014. ^ "American League". Chicago Tribune. Retrieved August 25, 2013. ^ Sources recently have dissociated the 1902–1903 Baltimore Orioles from the Highlanders/Yankees. Sports Reference.com Archived July 23, 2014, at the Wayback Machine and sources cited on that page. Retrieved July 23, 2014. ^ Edgarf. "Baltimore Orioles History – American League East". MLB Baseball Betting. Retrieved August 25, 2013.